Günter Grass’s most recent opus is a miniature epic, packing an amazing amount of material into a single afternoon’s read. The Nobel Prize winner here writes in an elliptical, fragmentary mode; there is so much to read between the lines that his prose sometimes verges on poetry, though there is another art form at work. Subtitled “Tales from the Darkroom,” the narrative hinges around photography, revealing deep love for photographic mechanics and particular reverence for a certain old Agfa camera. Grass has set up a stunning parallel between photography and memory. In both cases, he argues, the spatial and temporal constraints that ruled the original moment no longer apply. Thus, the magical Agfa can capture phenomena that are not, in the strictest sense, there in the first place. Likewise, the act of remembrance is as much one of imagination as it is of history, as Grass, a master novelist knows all too well. A fellow German, the luminary filmmaker Werner Herzog, speaks of a secret magic of cinema, instances when forces beyond direction come to the surface, and it’s these instances which Grass seems intent on capturing here, though the book is also a sort of memoir (following 2007’s Peeling the Onionand to be followed by what he claims is his final foray into memoir, Grimms' Words: A Declaration of Love). “The only thing about which there should be no doubt is that once upon a time there were guardian angels, when Marienchen could prove everything in black and white” Grass writes. Such sentiments smack of another recent star of German literature, W. G. Sebald, who famously went so far as to fill his small oeuvre with black and white photos, which bore diverse relationships to the text, but consistently ushered the reader into a highly charged space where the shaky dynamic between representation and history creates a kind of euphoria. 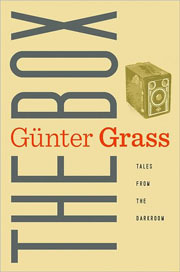 The Box focuses largely on the period when Grass was writing Dog Years (the conclusion of his Danzig Trilogy, which began with his masterpiece The Tin Drum), and he gives the reader a good sense of his writing process, implying that photographs were in fact essential to his prose. “And on the stove, which she’d made a point of photographing, a kettle was steaming, as if someone not visible in the picture, the mother say, was about to make tea or coffee” he writes. It’s refreshing to read Grass in such an intimate and relaxed mode; his career has been so politicized that it has at times been tempting to let that overshadow his artistry. Grass served in the SS (as he recounts inPeeling the Onion), and was one of the founders of a distinctly European magical-realism, but here he seems to be planning a vanishing act. Though the final lines of The Box do anticipate more ink to come, the work’s obsession with time eventually indicts itself and its author, admitting not only the inevitability but also the seductive power of that final step out of existence.